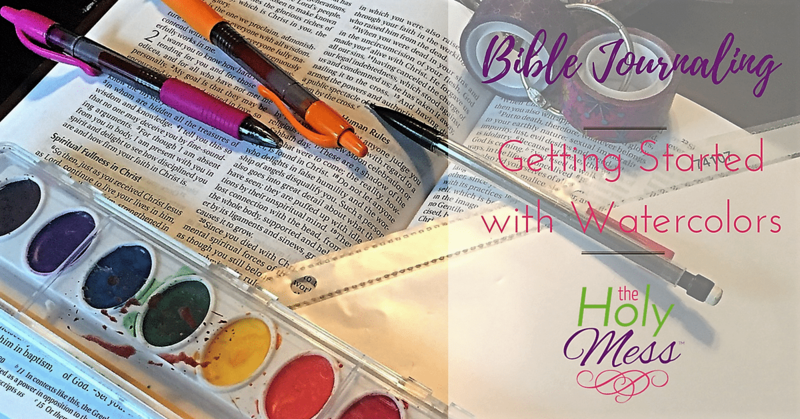 Have you wanted to watercolor in your Bible but weren’t sure how to get started? This tutorial will walk you through the process of getting started with watercolors, especially for Bible journaling. Today I am excited to host guest writer Victoria Weaver. Victoria isn’t scared to paint in her Bible. 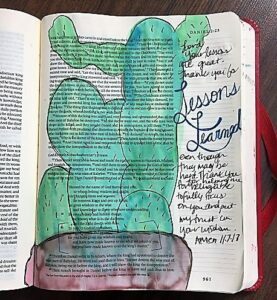 Recently tasked with journaling Bibles for Hurricane Harvey victims from her local community, Victoria has blessed us with a first-hand look at her creative process. 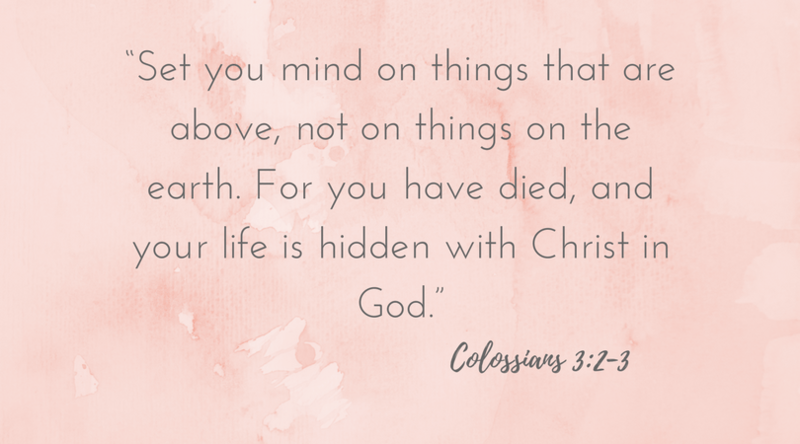 Check out these watercolors tips to turn your Bible journaling pages into works of art. 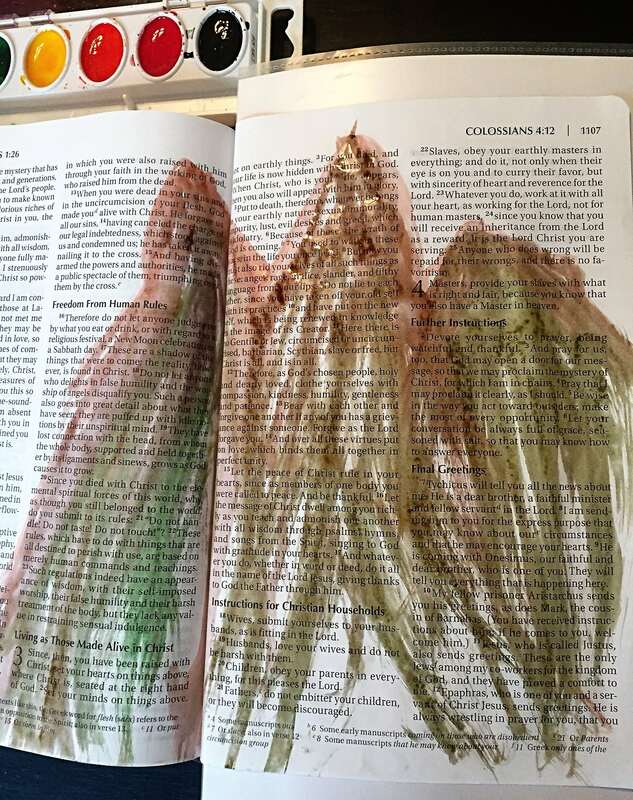 Paint in your Bible? Let’s give it a try! I tried to think about the last time I used watercolors and I am pretty sure it was way back in elementary school. Maybe middle school art class? I guess I haven’t used them because I thought that they were for small children. It turns out watercolors are a great resource for Bible journalers! 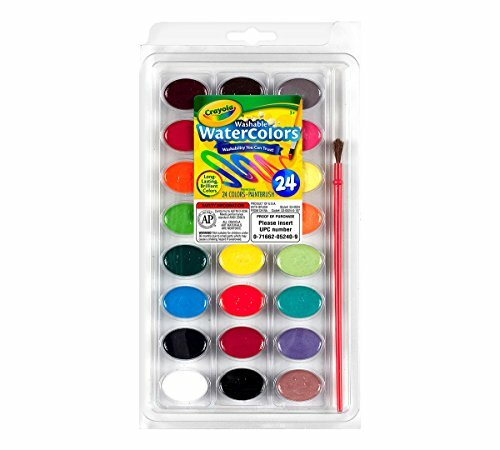 Grab some basic supplies including: watercolors , water, a good black pen , and colored pencils . I needed to put some artwork in a Bible that was not my own and wasn’t an actual Bible with a margin. I decided that a watercolor medium would be the best so that the words could still be seen and the special family receiving this Bible would find the pages useful. Mountains were an easy theme to help me focus upward. I decided on a brown-green scheme for colors in hopes that I could cover a mistake easily! I also wanted these mountains to be earthy. Put cardstock in a plastic sheet protector. Use it behind a page (especially with paint) to protect the pages underneath and it will give you a sturdy back. 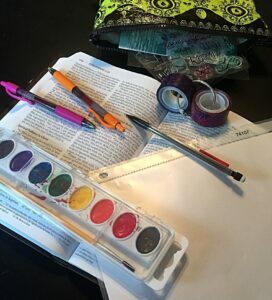 I got this tip from a fellow Bible journaler and she likes to use it behind all her working pages. 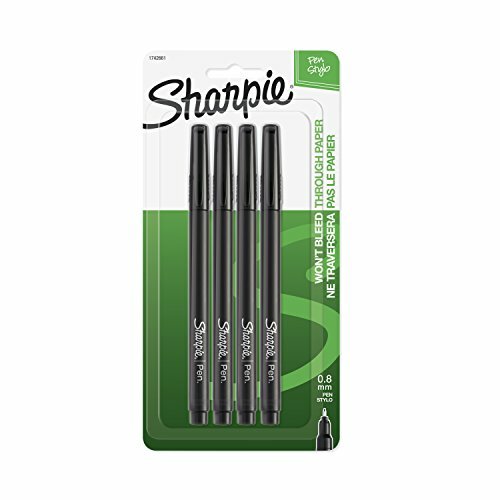 When using pens, it helps the indentation of the pen not to appear on other pages. Feel free to cut this down to be just a little bigger than your journaling pages. The key to putting watercolor paint on very thin pages is to use simple strokes and little water. This helps the pages not to get soaked but still puts color on the page. If the page seems to be getting damp, take a break to allow it to dry a bit before adding more color. After I had the basic mountains, I noticed I had areas of white and I needed more colors to help blend. 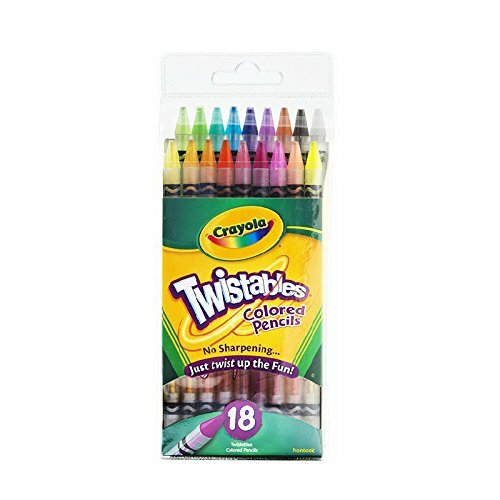 Once the pages were dried, I used colored pencils (I really love these ) to help add to the blending. Blending is super hard for me so using two different mediums helps me to cover mistakes and makes me feel like my art has more depth. I used about four to five lighter colors to fill in the mountains. After I stepped back, I realized the mountains needed a little something. I used a black pen to add an outline and add “rocks.” I used the only blank space above the mountains to write out the verse. I also added in a sun with colored pencils coming out from the mountains. This design took me about 30 minutes and I had two small children trying to do their own Bibles and grab all my supplies. Sometimes I find myself overwhelmed by the beauty of other artists, but I remind myself that this is my time to God. I really love how this quick watercolor design turned out! Here are couple of my watercolor designs with simple strokes and then outlined in pen. 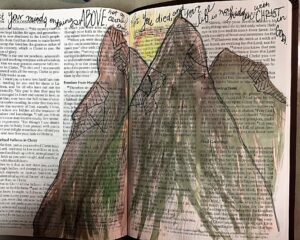 I wanted to share a little more about this special Bible featured in the mountain design. I live south of Houston in an area that was affected by Hurricane Harvey. Our church, Gloria Dei Lutheran Church, has partnered with a local organization to rebuild a neighborhood devastated by the hurricane. The retaining wall that surrounded the neighborhood held all the water in so every house was flooded. We have committed to rebuilding 50 homes in this neighborhood. As a home is rebuilt, our city pastor has a house blessing with the family. We are gifting each family with a Bible that has been signed by our staff and also contains some artwork. If you would like more information about our work in the South Shore neighborhood or want to find out how to help check out our church website by clicking here. Victoria Weaver is a wife and mother of 2 … with twins on the way! 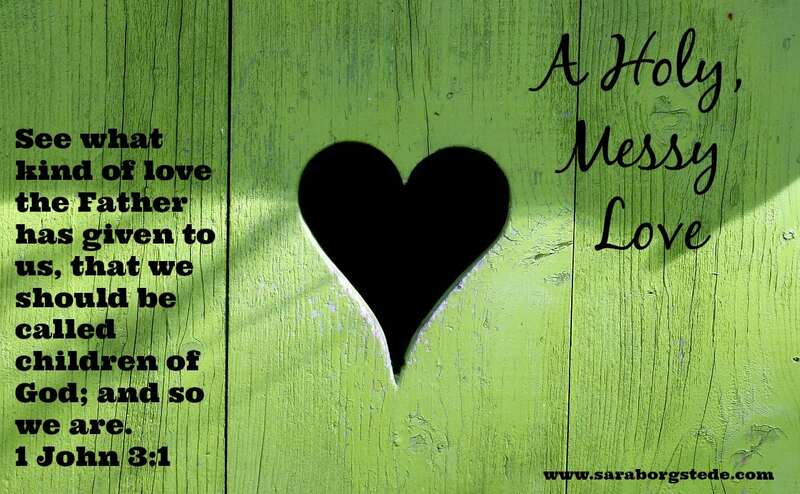 As a trained Christian educator she is passionate about cultivating “faith-formers” in the home. 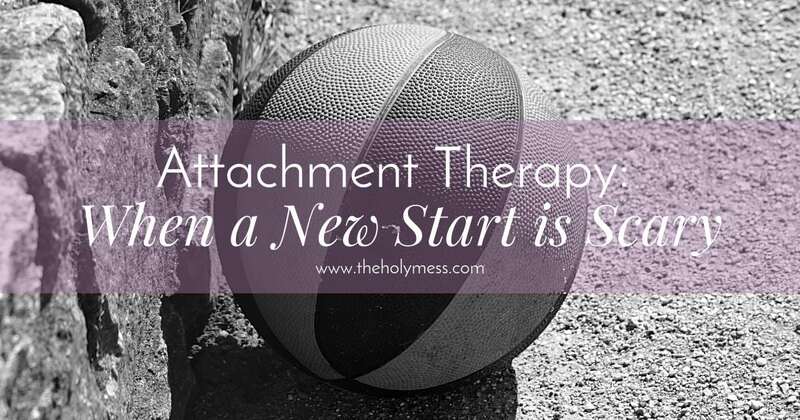 She loves to help families discover new ways to incorporate faith into every aspect of their lives. Victoria strives to get people excited about God’s word. 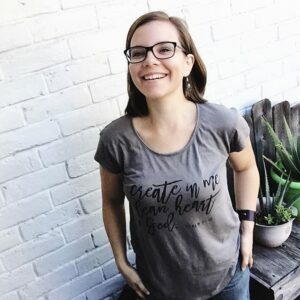 Her passion for creating makes visual faith something that easily flows. She enjoys trying all forms of visual faith and works with parents and families to create visual faith for their homes. Grab a cup of coffee and follow her on Instagram @upcycledcharm. Have you ever painted in your Bible? 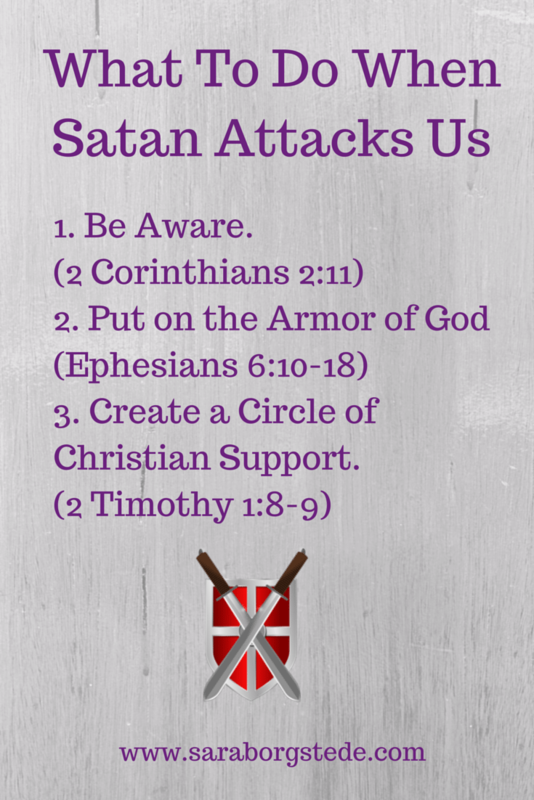 Share about it in the comments below and at The Holy Mess Bible Journaling Group here. PreviousDo You Need Confession and Absolution? Thanks for the comment Suzanne. I find when you just try it then it never turns out too bad. So just do it! 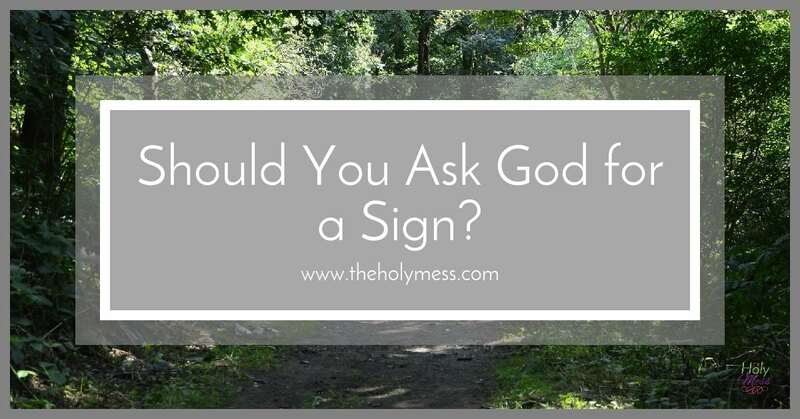 If it goes horribly wrong then go here: https://www.facebook.com/groups/TheHolyMessBibleJournaling/ and we’ll help you fix it. I have really got to become brave and just do this!! I love all that I see, but I keep being afraid I’ll ruin it. i have to remind myself that I can always get a new one (or I just had the thought to get one at a 2nd hand store!!). Anyway, thanks for the inspirations! !